Bearing in mind the nature of the content of this letter coming from a person without any referral, I apologize for any inconvenience, but please read and objectively consider if we can work together. My client had an investment on fixed deposit value of US$15.5 Million. [Fifteen Million, Five Hundred thousand U.S.Dollars.] deposited in a private bank here with no nominated successor in title over this investment. The bank where his money was deposited has issued me a notice to contact the next of kin, or the account will be confiscated. I want you to assist in distributing the money left behind by my client otherwise it will be sent to the treasury by the bank. I have already developed a full proof, legal and totally risk free means through which the fund can be released to you within a very short time after due documentation and authentication process. The strategy is to use my position and influence as the lawyer of the deceased to present you as a next of Kin and beneficiary of the deposit so that the proceeds of this account can be paid to you. I want to assure you that I have concluded all local modalities for the successful completion of this within ten banking days of your agreement to proceed with me as the required assistance are perfected to be safe and without any breach of law. Please contact me at once to indicate your interest. I will like you to acknowledge the receipt of this E-mail as soon as possible via my private E-mail (barristeralinahcheng@gmail.com )and treat with absolute confidentiality and sincerity I look forward to your quick reply. I want a situation where by you assist me to make the claim of this fund from the bank so that it will be delivered to your custody . 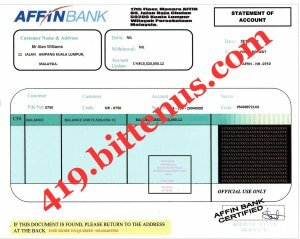 I will be offering you 45% of the fund for your foreign assistance as long as you can help me out in carrying out this project effectively without insinuating greed and selfishness.I also sent you the bank statement to prove the said amount exist.I am contacting you in this respect for the below purposes. (1)My financial incapability of making the claim at the moment. (2)To avoid freezing of the funds by Malaysian Government. Please if u can assist me do this i will appreciate that a lot.